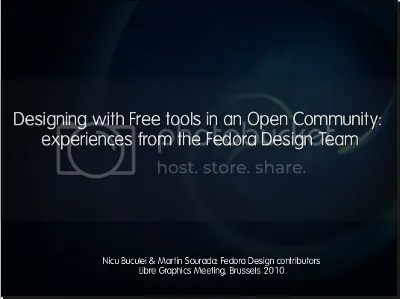 Nicu Buculei and Martin Sourada gave a presentation about the Fedora Design team at this year’s Libre Graphics Meeting last week. (Slides available.) One of the most important points they shared about our team is our commitment to an open and inclusive process. We want folks to use open formats and collaborate in an open way, using open source tools, sharing sources and working together rather than in competition. An ongoing goal for the team is to get greater community participation in creating artwork for Fedora. So how did the Fedora Design Team do for Fedora 13? How’s that hopey, changeyopen-y, freedom-y thing working out for us? 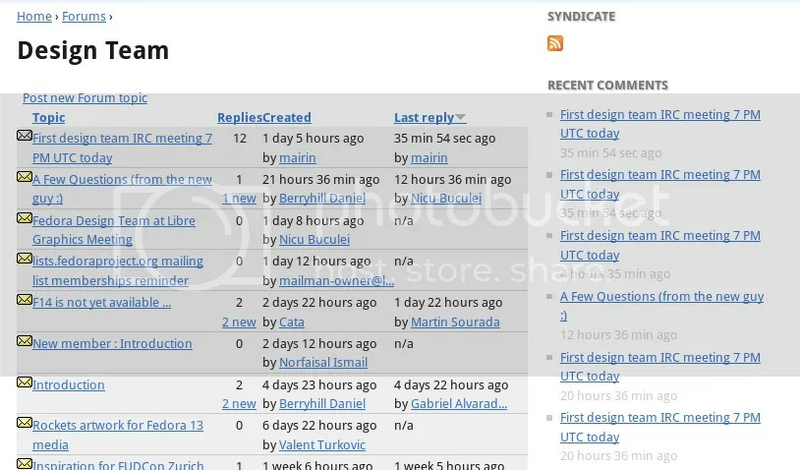 How did things go for the Fedora Design Team in Fedora 13? We were able to have artwork checked in the Alpha, the earliest yet. We also had wide participation on the artwork, perhaps the widest yet. Alexander Smirnov rocked the house with both the small release banner designs, countdown banners, and media artwork. He created the slick F13 small banner design that a lot of people have complimented! The main rocket launch banner for release day (shown above) was designed by Fabian Scherschel (new contributor!) of the Linux Outlaws podcast fame. Tatica Leandro and myself designed the F13 release party poster. All-in-all, we’ve done well for Fedora 13 – thanks to all our designer rockstars who pitched in! Of course, we can and will do better for Fedora 14. This week we had our first regular weekly team meeting on IRC. We’re hoping that having regular real-time meetings will make it easier for folks to participate and help us better work together. You can see the meeting bot minute minutes of our first meeting including the full log or read a condensed manual summary. As Kyle Baker illustrated a couple of weeks ago, it can be hard for a designer not familiar with open source communities and communication tools (IRC, mailing lists, etc.) to participate, and we might be losing out on a lot of awesome rockstar designers who believe in our mission and values but are too overwhelmed by the learning curve involved to simply communicate. Hopey Changey! Hahahaha I love it. Mairin you rock! Loved your previous post in March on this topic, and enjoying your drupal experiment here. Thanks for sharing your ideas and mock-ups! Looking forward to following and learning from the design-team blog and forum.